Naples is known for its delectable street food, from iconic pizza al portafoglio (wood-fired Neapolitan pizza folded twice into a handy triangle) to picturesque o’ cuoppo (a paper cone filled with crisp fried fish and seafood), made and served expressly for the purpose of eating on the go with minimal muss and fuss. You may be surprised to learn, however, that one of the most historic street foods in this bustling port city is possibly one of the mussiest and fussiest of all dishes, and was once so ubiquitous along the working-class quarters of the historic center that it earned Neapolitans a nickname that stuck for over a century: i mangiamaccheroni. Naples during the 1800s was teeming with street vendors hawking inexpensive yet filling plates of anything from pizza fritta (fried dough) to fish stew, but one of the most common and—to modern eyes—most unlikely of these were the maccheroni sellers, who served heaping dishes of long strands of pasta known by the generic term of “maccheroni” to be devoured by their customers with their bare hands. How pasta began as a delicacy for the nobility and ended as the favorite dish for the city’s poor and working class is a long story, closely tied to the price of wheat and the mechanisation of pasta production. Arab merchants introduced pasta to Sicily in the 1300s; by the 1600s, pasta was a staple of the diet of the wealthier classes and a rare treat for the peasantry and working classes. In the late 17th century, however, the price of meat and vegetables rose and the price of wheat dropped. Poor Neapolitans who had previously subsisted on fish and vegetables (so much so that they had been known as “mangiafoglie”, or leaf-eaters) now began to turn to bread and pasta: cheap, filling, and caloric. The city of Naples, with easy access to local durum wheat and water, became a center of pasta production, and the backstreets and courtyards were filled with racks of pasta drying in the sun. In addition, mechanical presses brought mass pasta production at lower cost in the same period, and maccheroni took its place as the city’s most beloved food. 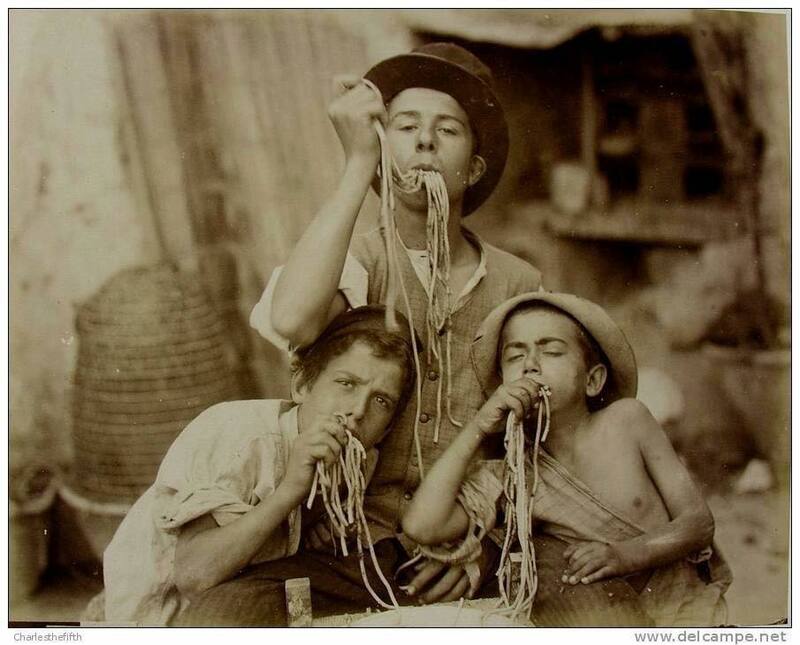 From leaf-eaters, Neapolitans became known as macaroni-eaters, a derogatory term previously reserved for Sicilians. As pasta was demoted from elite dish to working-class staple, it began to be served like most food in Naples: from open-air street and market stalls. Vendors would extract a tangle of long strands of thick pasta from open cauldrons of boiling water and hand it to their waiting customers, who would pick up the noodles in one fistful and lower them into their mouths. 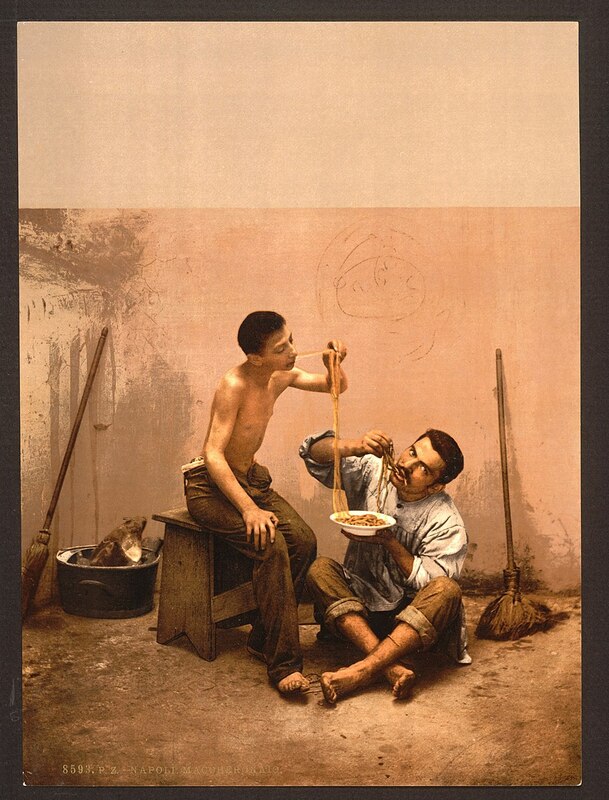 The pasta would be consumed a single, long gulp, a technique that became so famous that watching local mangiamaccheroni consume their pasta with their bare hands became a popular tourist attraction by the 1800s, depicted in paintings, prints and postcards. Aristocrats and artists coming through Naples on their Grand Tour would toss a coin to the lazzaroni (street urchins), who would dash to the nearest maccheroni stand for a heap of steaming noodles to stuff in their mouth by the fistful—a spectacle that was amusing for onlookers at the time, but for modern eyes is poignant testimony to the poverty that has plagued Naples’ working-class families for centuries. Not only was pasta consumption an open-air activity, but pasta production and preparation was also largely done outside. 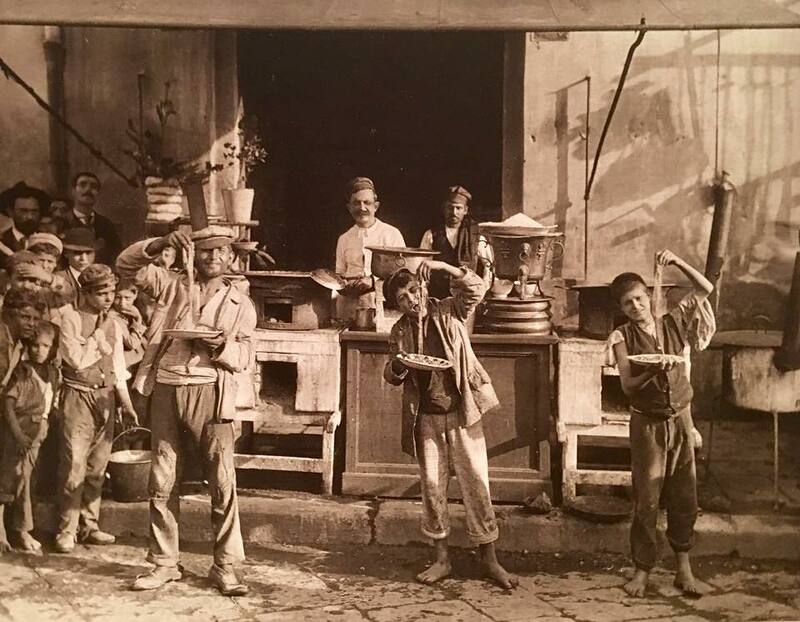 Fresh durum-wheat pasta was mixed in large open troughs and churned out of a mechanical “torchio” (screw press), and long strands were then hung from cane racks or spread over large cloths to dry in the Mediterranean sun and breeze. The noodles were boiled in a large cauldron set over an open fire in tiny street shops or market stalls, with a dab of pork grease and handful of salt to flavor the water, and hard cheese grated over the top (tomato sauce didn’t come into fashion until the 19th century). Though it may seem picturesque, the reality was much more grim. Contemporary travelers remarked on the low-quality of the streetside pasta, made in squalid conditions and hung to dry among the filthy, fly-infested streets. The open-air shops and stalls where the noodles were boiled were also less than sanitary, and the cooked pasta was known for its slightly “off” taste. Like this article? Don't miss "29 Things You Must Do In Naples." Just like its rise, the fall of Naples as Italy’s pasta capital is tied to the production of durum wheat. At the beginning of the 20th century, Mussolini began a campaign to expand the production this important staple to the center and north of Italy to limit the country’s reliance on imported goods. As a result, production of pasta moved from the backstreets of urban Naples to modern northern factories, who used electric presses and drying tunnels to churn out cleaner, albeit less photogenic, shapes of pasta. As pasta became a packaged good bought in stores, its consumption moved from street vendors to kitchen tables, where forks gradually replaced hands.